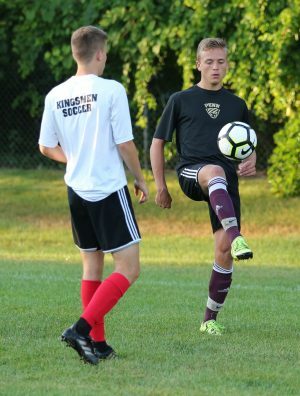 The Penn Boys Soccer team has some of the hardest-working athletes in the school, and one of the players who sets the standard for hard work is senior leader Brandon Stahl. Stahl is in his fourth year in the Kingsmen Soccer program. His older brother Justin influenced him to join the Penn program. Moved by his brother’s passion for Penn Soccer, Stahl started practiced some of the moves and techniques and trained with him all the time. Now, Brandon Stahl is carving out a name for himself in Penn Soccer. Early in his career, Stahl dominated on defense. He played center back for most his career, but this year things changed. Stahl was switched to plays center midfielder this season, and has helped the Kingsmen power into the Top 10 in the state. Stahl’s play helped Penn knock off the nation’s No. 4 team, Hamilton Southeastern, 2-0. “I really liked the transition from center back to center mid, because it gave me a lot more freedom on the ball, but I still had similar responsibilities defensively as I did when I was on defense,” Stahl said. Stahl is also a Captain on the varsity soccer team. Stahl is a very unselfish player and wants the best for the team. He is looking forward to the state tournament and a possible run to the state championship. Brandon Stahl has some of the best dribbling skills and his control on the ball is insane. He is definitely a player you have to come watch in person. On Wednesday, Sept. 27, the Kingsmen will host their Senior Night. But for Brandon Stahl and the Kingsmen Seniors, they’re hoping that their legacy is just about to begin with a spectacular post-season run.